The common challenge people face is how to incorporate fitness into their lives. They know they have to do something to get in shape but they really do not know how. The internet is filled with a lot of information that one may easily get confused so much as you may not know where to begin. Our society has so many food choices that contributes to weight gain, sedentary lifestyle is also a contributory factor on acquiring these extra pounds. However there are benefits involved when we exercise and manage what we take into our body. So where do we begin? Or is it How do we begin? Make the choice to Start living a healthy lifestyle by getting a copy of the SMART fitness planner. The digital downloads are very easy to download and work with but I personally prefer the paperback which is very realistic, doodling my activities on paper and pasting on walls is genius. The SMART Fitness Planner has been designed to help you define your goals in a meaningful manner to banish overwhelm and confusion. It will guide you throughout your transformational journey to make sure you stay on target at all times. It has been created with printable pages are bland by design to save your ink and to leave you room to be creative as you fill them in. Just have fun as you go. You can reuse the same pages over and over again to schedule your exercise sessions or print them anew any time you want. For best results it’s important that you print the actual planner section of the pdf and fill it in with pen and paper. This is the first step to give your initial idea a tangible form. Making the decision to do something provides a form of commitment made to yourself, deciding that you need to change behavior and create new possibilities depends on your attitude towards your goals. Smart fitness planner has got you covered and will guide you towards achieving your goals. The smart fitness planner has lots of benefits and it is very realistic, it helps you to measure your progress and how often you should be doing so,to keep your morale high and your health in good shape. It also teaches you the easy way to tell if your metabolism is balanced and supporting your weight loss efforts. It encourages you to know how to dig deep into your heart and define the real reasons motivating you to get started on a weight loss and fitness journey. It also encourages you to write down your plans and follow through. The essence of writing down your mile stone is to help you stay in check. The interesting part is that SMART Fitness Planner has a Club on Facebook where people who purchase either version of the planner can join for a small monthly fee to get first hand help with planning their fitness journey! How cool. 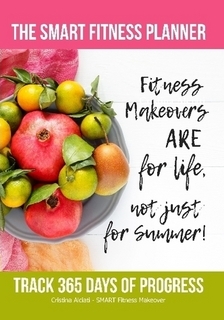 let's get healthy for life not just for summer!